Camera straps — boon or bane? You are here: Home / The Last Word / Camera straps — boon or bane? Actually, they are both. In the field they’re convenient, but I have damaged more cameras because of straps than the number of times a strap saved my bacon. I once picked a D800E off a low ledge, and didn’t notice that I was standing on a part of the strap which was on the ground. Result: an expensive repair to both the body and the lens. In the studio, straps are way more trouble than they’re worth. They are always catching on things, followed by scary camera-juggling moments and likely inadvertent movement of carefully set up lights and modifiers. When I first got the GFX earlier in the year, I was excited to find that it was easy to unclip and reclip the strap. I started only using it when I was going to be out and about and needed my hands free. Delightful. Why not do something similar with all my other cameras, I thought. I found a great way to make that work. These are made by a company called Peak Design. You can get them on Amazon, at B&H or from the manufacturer. They also sell straps, but if you’re happy with the ones you’ve got, all you need is a few kits like the one above. 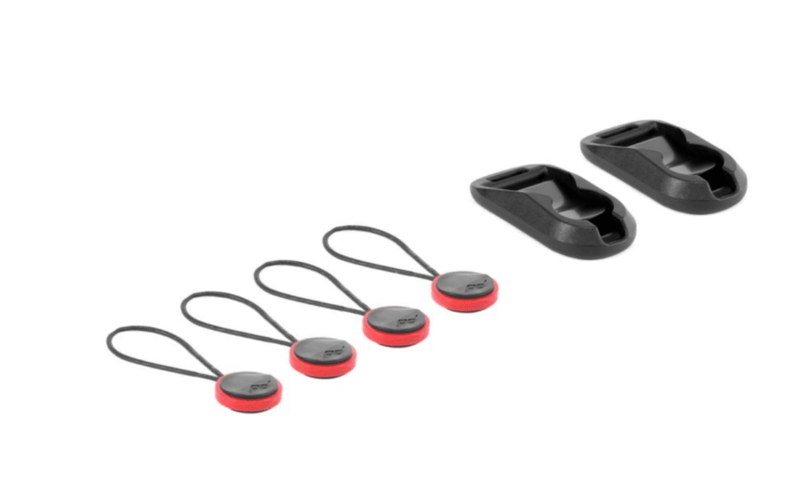 You take the thingies with the red-rimmed disk and loop them through the eyelets on all your cameras. Then you put the black clips on one or two of your straps. You can easily clip the two parts together, and just as easily take them apart. It looks like they won’t separate by accident, either, something that I worry about with the GFX (Fuji has clips that keep that from happening, but they make it really hard to unclip the strap when you want to). Problem solved. I do worry a bit about the strength of the cord loops. There’s a red wear indicator inside, and if you see it, you should change out the loops. I won’t carry a camera w/o a strap, but most of the time I wrap it around my wrist. Plus they’re a pain for tripod work as they give the wind something to play with and bang around. The Peak Design Cuff looks like it will do what I need it to do. I haven’t used a regular strap for years… somehow a camera hanging around a neck on a strap is more psychologically visible than one being carried in the hand (I’m mostly a street photographer). It’s also inconvenient if I need to run, or push through a crowd. Last weekend I tried out a wrist-strap attached by a fitting in the tripod mount, in case the cold weather made my grip less certain. The jury is still out. Love Peak Design’s system! I hate having a strap always attached and was an early adopter of Peak’s straps. So far (four years?) I’ve never had a problem. I’ve got Peak Design’s system for both my D500 and D850. Love their straps. Never a problem and the piece at the bottom of the camera is an ARCA-compatible tripod plate. I find the Peak Arca Swiss plate to be kinda small, and I worry about stability. I’m getting a collection of them, though, as they seem to come with a lot of Peak packages. I guess I can use them for strobes and such.